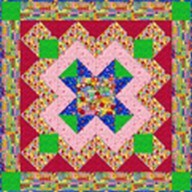 En esta sección encontrarás todas las explicaciones necesarias para realizar algunos proyectos de patchwork. Si deseas las telas que aparecen en dichos proyectos, las puedes encontrar en nuestra página. Si tienes alguna duda, consulta o sugerencia a realizar, no dudes en ponerte en contacto con nosotros. Esperamos que dichos proyectos sean de vuestro agrado. 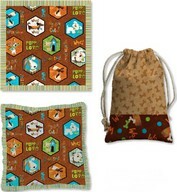 Featuring our furry, best friends framed in trendy hexagonal shapes, this collection is doggone cute! Trendy colors will appeal to all age groups. Our project ideas show just how versatile these prints can be in a lap quilt for owners, a doggie bed (in 3 sizes) for pets and a drawstring bag to hold those all-important treats! Romantic, floral fabric collections are always in style and this one is no exception. A subtle damask background lends depth to the large focal print. 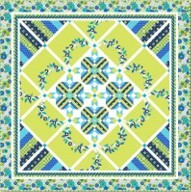 Elegant quilts as well as shams and bed skirts will all benefit from these rich prints and lush color palette. 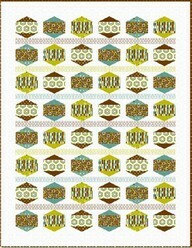 The ecru colorway of the Ashley prints will make a lovely backing for a quilt made with these fabrics. This premiere collection from artist, Susie Robbins, features her rich watercolor art in a crisp, clean color palette that is right on trend for 2014. Graphic patterns balance the lush, botanical motifs to create a collection vibrant with contemporary style. 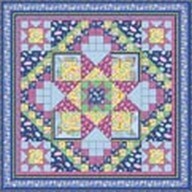 Ideal for quilts as well as skirts, totes, kitchen décor and more! 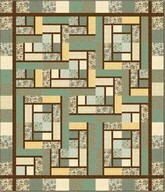 Susie designed our project quilt that features her signature style of working with blended fabrics. 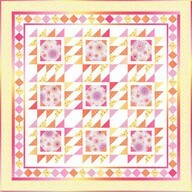 Note that all skus are used in the quilt and most are cut as fat 1/4's or fat 1/8's so it's easy to kit! 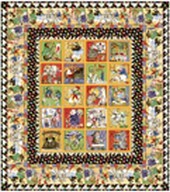 Quilt size: 42 1/2" x 50 1/2"
The gesture, Namaste, is commonly used at the beginning of each yoga session as the equivalent to "greeting" or "be well". It shows a sign of respect from one person to another. The designs in this group combine Yoga and Asian inspired motifs. The symbolic tonal print is an "Om" design based on a word that is typically used during meditation. The soft color palette is calm & soothing making these fabrics ideal for not only quilts but many other home décor items. In addition, use the project pattern to make a yoga bag to carry a mat and supplies! This striking main print is reminiscent of the Spirograph® designs that we all made as kids! A vibrant palette of sherbet colors makes this a collection that is too yummy to resist! 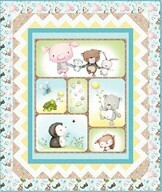 Simple and fun panel quilt featuring adorable animals any child is sure to love. 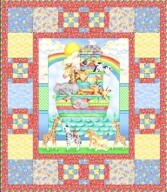 Simple and fun pieced quilt featuring adorable animals any child is sure to love. We're so excited to partner with The Smithsonian for this premiere collection! Photorealistic art shows a variety of the Apollo rockets with the focal stripe depicting the moon landing of Apollo 16! As the space program evolved, shuttles were introduced and are also included as part of this amazing collection. Wonderful fabrics for teachers to use in the classroom, kids to use for projects and for all the rest of us to create a remembrance of a truly remarkable part of our history! 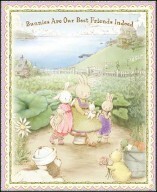 "My Besties" artwork is seen in greeting cards, designer dolls, book covers and other products. 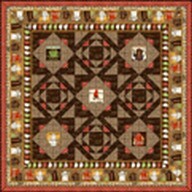 Quilt measures: 65" x 93" Pillowcase measures: 20" x 30"
Rudolph 50 Years and Still Glowing quilt. 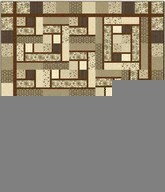 15 rectangles each with a different character image. 56" x 76"
Rudolph 50 Years and Still Glowing placemats. Make 4 placemats total with a different character on each side. 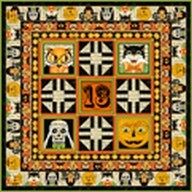 This collection of classic, Halloween motifs uses rich colors and a comic, illustrated style. The panel design can be used to make a multitude of projects as listed on the side of the panel itself. 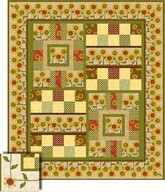 Use it as the basis for a wall quilt, twin banners or a reversible banner and even placemats. 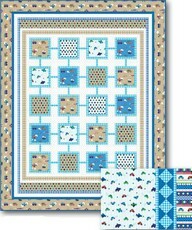 Large crib or toddler quilt that includes a fun, chevron border. 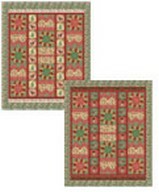 This group is offered in both flat and flannel cotton. 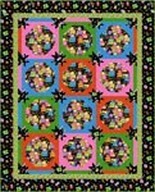 A back-to-school group that's full of color and detail - great for backpacks, lunch bags as well as for use in classrooms.Twin-sized quilt. Did you know that the poinsettia flower is referred to by many as The Christmas Star? 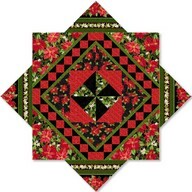 This traditional and elegant collection features both the poinsettia as well as the small, white Star of Bethlehem flower. Gold metallic accents gives this collection some extra sheen and making it even more elegant. 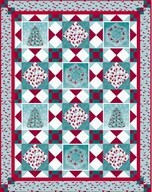 Free downloadable project lets you make a table cover or tree skirt in two color ways. This beautifully detailed paisley collection combines traditional patterns with a modern, color palette. This blue sage color is seen repeatedly in upcoming home décor collections. 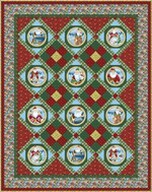 Traditional designs rich in color and detail will appeal to a broad range of sewers. We've added something new with copper metallic accents lend warmth and sophistication to the group. 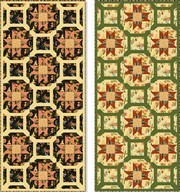 Project allows you to make two table runners. 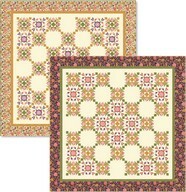 Block print features botanical designs both in color as well as shadowed or etched. 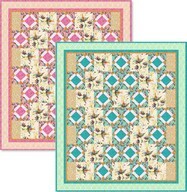 5" squares can be used individually or in groups - two rows will yield three sets of four blocks each (great to use as quilt blocks) and three rows will yield two sets of nine blocks each (great for pillows!). 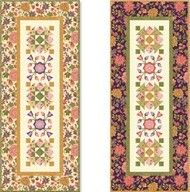 Can also be used as rows to create borders or focal sashing for a quilt. These fabrics exude sophisticated, graphic elegance with silhouettes that fall on a watery, blended background. Crisp black and white motifs are augmented by the subdued color of smoky lavender. We're hearing that black is becoming more pronounced heading into 2014 so we're providing our project quilt in both a light (white) as well as a dark (black) option! 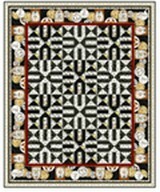 Also, project quilt is shown in two colorways and between both, they use all skus in the collection as well as either a black or white Quilting Illusions print. Kids young and old love monsters! Monsters continue to be shown across channels in all sorts of products. This project can be made for a boy or a girl in two different color ways. 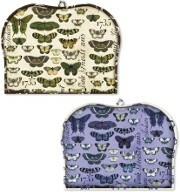 This is the follow-up collection to the popular She Who Sews collection. This new group continues to feature the creative characters that Janet calls "Handmaids". Just like She Who Sews, these designs are steampunk inspired with a creative, colorful twist. 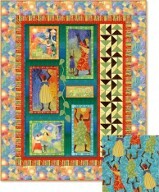 The images revolve around sewing, painting, and art and are created in Janet's whimsical and colorful style. Take a break at any time! This is a collection for the true tea and coffee lover! Reflecting a style used to create menu chalkboards in a local coffee shop, these designs have a cozy and inviting feel to them. Featuring sweet cakes and beautiful hand lettering, this collection is excellent for kitchen décor and so much more. This inaugural fabric collection from artist, Ellie Record, features impressionistic, fantasy-style flowers that are young and fun! A pink & turquoise color palette is kept from being too sweet with the addition of soft tan and tangerine orange. 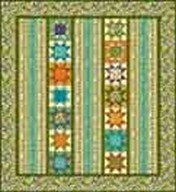 Make a Table Runner or Quilt in both colorways! Adorable, goofy monsters are all the rage in this "play on words" collection. 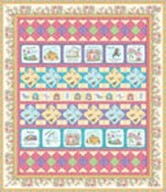 Perfect for decorating a kids' bedroom - curtains, pillow cases, wall banners, quilt - or make a shower curtain for their bathroom! Kids will identify with this collection as there are a number of video games for little ones that use monster trucks for the theme. Desiree designed the project quilt which looks as though there are tire tracks running the length of the quilt! As a kid (or a teacher), there's nothing better than a few snow days but if you're a sewer then Snow Daze fabrics are ideal! 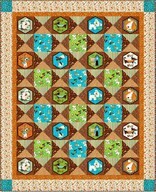 Whimsical snowmen are showcased in 6" blocks using a timely color palette that combines soft with vibrant hues. 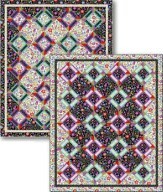 Quilt is available in 2 different colorways measuring 45 1/2" x 60 1/2". Graphic motifs combine with rich, trendy colors to create a group that is appropriate for all seasons and a multitude of projects as well. Its broad appeal means that it can work for adults, tweens and even to create the trendiest of nurseries! From totes to shower curtains, sewers will find endless possibilities for using these prints. Traditional paisley motifs were refreshed with a crisp style and on-trend color palette to create this contemporary fabric collection. 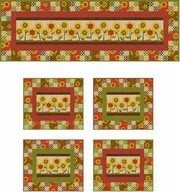 Angela's warm and distinctive style radiates in her newest fabric collection. 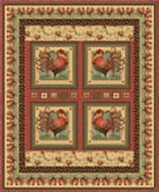 Classic autumn motifs and rich colors are used to create prints that will have universal appeal. The panel and wide, border stripe combined with the coordinate prints create lots of creative potential as shown in our assortment of projects. 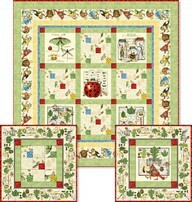 Twin banners, a quilt with two border options, table runner and placemats will all make great kits for any shop. 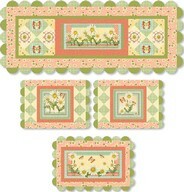 Nostalgic memories of Grandma's garden are reflected in the soft, gentle motifs and colors of this lovely collection. The sweet homey feel is accented by the use of a soft yet timely color palette making this a collection that will work perfectly in all areas of the home. Our projects include a beautiful lap/sofa quilt as well as a hostess/kitchen set that features the elements of the pretty panel. 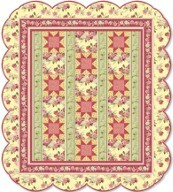 Those projects include a table runner, placemats and a buffet mat all with scalloped edges! 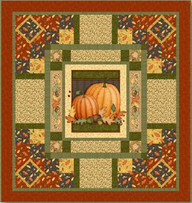 Harvest Fare quilt measures 65" x 69" and features your classic Autumn colors. Lil Miss Cutie Patootie is back in town with a quilt project as sweet as can be! 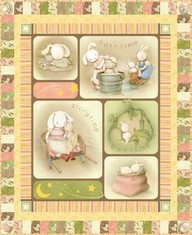 Our newest collection from Bunnies by the Bay offers a soft, cuddly feel. 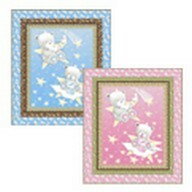 The subtle, color palette is timely to decorate any nursery or to create a special baby gift. 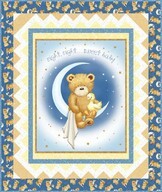 Our project pattern includes instructions for a crib quilt using the panel. 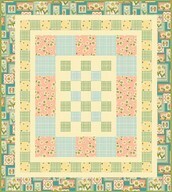 Quilt size 44 1/2" x 54 1/2"
Vintage florals in a timely color palette of dove grey, cinnamon rose, aqua and olive are sure to catch the eye of a broad range of sewers and quilters! Make a quilt, runner or both. 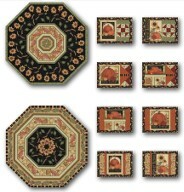 This classic, paisley collection is colored in home-friendly hues of rich red, brown and amber with accents of olive. So richly elegant and lush that it's perfect to use in absolutely any room of the house. These fabrics were designed with home décor in mind so think of using them for window treatments, chair cushions, table runners and placemats. 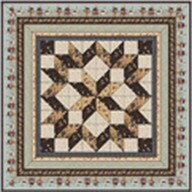 Our project pattern includes instructions for a queen-sized bed runner. 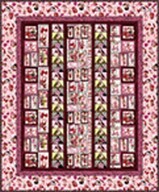 109" x 41"
This classic, paisley collection is colored in home-friendly hues of rich red, brown and amber with accents of olive. So richly elegant and lush that it's perfect to use in absolutely any room of the house. These fabrics were designed with home décor in mind so think of using them for window treatments, chair cushions, table runners and placemats. 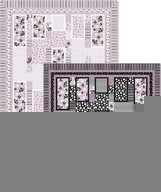 Our project pattern includes instructions for coordinating pillow shams as well as a wall quilt! 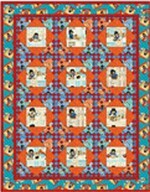 Lauren: Wall Hanging: 39" x 39" Pillow Shams: 31" x 25"
A celebration of motherhood is the joyful theme of this new collection. 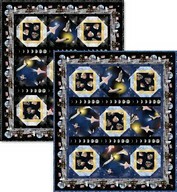 Three different images are repeated in the six block panel design. The prints resonate with color and texture. Because of the popularity of the tonal blender in her previous collection, Animal Magic, we repeated the tonal scroll print - at a slightly smaller scale - for this collection. Heidi Pridemore designed a sofa quilt that incorporates most of the prints and has a beautiful, transparency effect. This is the first collection in a series of (female) creative characters that Janet is calling "Handmaids." A new direction for Janet of Modern Vintage, Steampunk flavored with an inspirational influence. 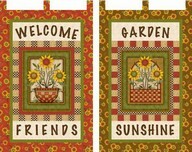 Images are sewing and quilting related with positive messaging. All things culinary continue to be one of the longest lasting trends in the past 10 years! People are not only cooking more but educating themselves on what they're eating. That includes an interest in growing their own herbs and collecting an array of spices. 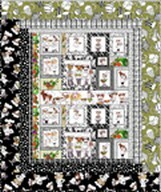 Our complimentary pattern contains instructions for a wall hanging, placemats or table runner. Most little girls take dance lessons at some point in their life and this collection celebrates that special time! 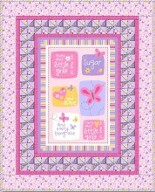 Use our complimentary pattern to make a generous, twin sized quilt and floor pillow for a special ballerina. lief! is a worldwide lifestyle brand with an appeal to all ages with simple but very trendy designs for both boys and girls. 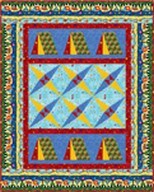 This girls quilt and pillowcase features trains, planes and automobiles in blues, reds and tans. lief! is a worldwide lifestyle brand with an appeal to all ages with simple but very trendy designs for both boys and girls. 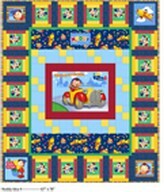 This boys quilt and pillowcase features trains, planes and automobiles in blues, reds and tans. 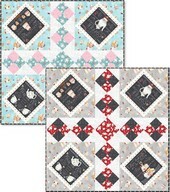 Cuddly quilt is reversible - one side is the whimsical panel and the other is easily pieced using the softly colored coordinates! 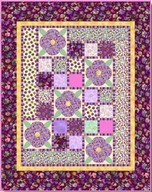 Applique flowers grace this beautiful quilt. 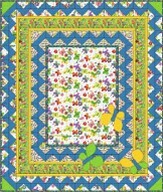 Monkey Around Quilt measures 72" x 80"
Monkey Around Companion Quilt 2 measures 59" x 65"
Something Old Something New Quilt - Kensington Studio 38" x 52"
Project sheet shows two version of a Tea Cozy using J Wecker Frisch's Short & Stout designs. Finished size is approximately 14" x 12". Project sheet shows two version of a topper using J Wecker Frisch's Short & Stout designs. Finished size is approximately 49" x 49". 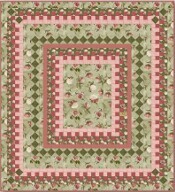 The Dominique quilt features fabric from our Denise Urban collection. 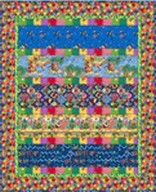 The quilt measures approximately 77" x 85"
Create this exotic and colorful quilt using designs from Julia Cairn's Dance of Life collection. 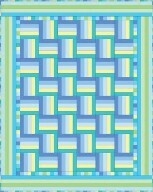 The approximate quilt size is 48 1/2" x 61 1/2". Instructions were revised February 2013. Revisions shown in red. 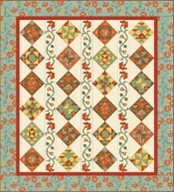 Folk Song Quilt from Christina Graf features two versions, a light center quilt and a dark center quilt. 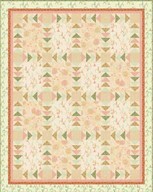 Both measure 77" x 94"
Tina Higgins - Peony Blush -Quilt Luscious peonies populate this lovely, feminine 86" x 94" bed quilt. 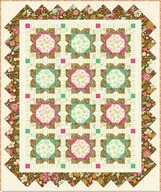 Luscious peonies populate this lovely, feminine 56" x 64" throw. A beautiful quilt with an inspiring message! 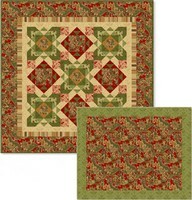 Paper pieced New York Beauty blocks highlight the warm, spicy colors of Sausalito. An interesting use of striped fabric makes a contemporary statement in this quilt while quiet metallic accents add even more sophistication! 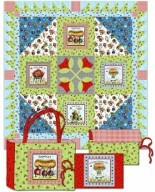 Cute picnic-size quilt, tote bag and tableware roll. 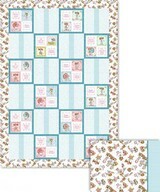 Sweet panels and a simple border make quick crib quilts in blue or pink! 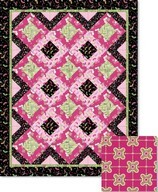 This project combines the feminine beauty of florals and lace in one gorgeous quilt! 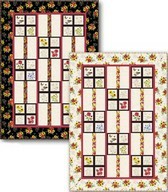 Easy quilt uses the panel as a base - an easy pieced backing makes the quilt reversible. 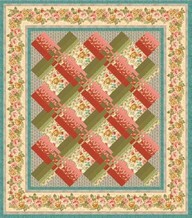 Create a rail fence quilt using just two fabrics - it's easy when one is from our Quilting Stripe collection! Loralie Designs - Hey Cupcake! 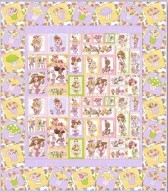 Cute cupcakes surround a simple panel in this adorable quilt! 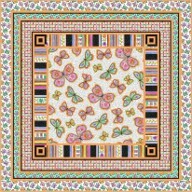 Time will flutter by while you make this 48" x 48" butterfly quilt from the designs of Christina Graff. 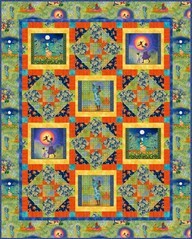 Robots, Dinosaurs, Martians as well as catch phrases make up this bright and colorful quilt. 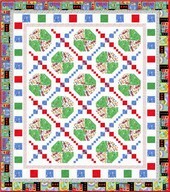 This 60" x 60" quilt from Debra Jordan Bryan's collection is sure to be a hit with your young one. 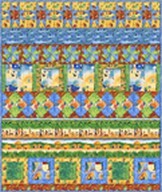 This oversized quilt created from the Mediterranean Dream line by Simon + Kabuki uses a variety of greens and blues. 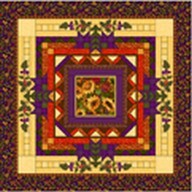 The half circle applique of flowers and leaves draw you into the center of this beautiful 88" x 88" quilt. The soft, flowery imagesare captured once again by the designer Tina Higgins. 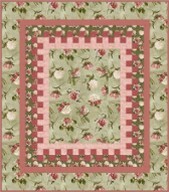 The quilt measures 78" x 88" and features camellia flowers framed by a scalloped edge. 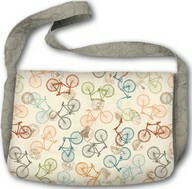 A great compliment to the Boys version from designs by Bethany Berndt Shackelford. 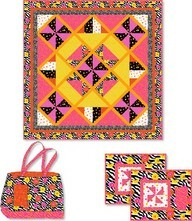 Dress up your little girls room with a great looking quilt. 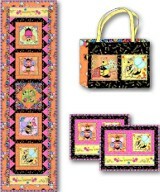 Make a variety of crafts from the Bee Yourself line by Phyllis Dobbs. 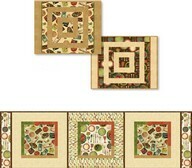 Choose from a tablerunner, Tote Bag, placemats or make all 3. 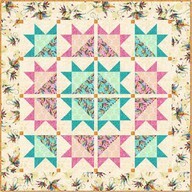 Find out what the buzz is all about by making this great quilt project. 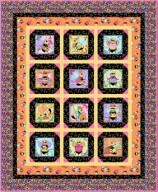 Bee Yourself from Phyllis Dobbs make a quilt 53" x 65". The world of Steampunk through the eyes of Roberta Morales. From a distance it appears to be your typical quilt until you take a closer look. Now the gears are turning. Is it Victorian or is it Science Fiction or maybe a combination of both. To us it's "Victorian Dream" and it measures 42" x 56". Quilt, Cape... you decide! 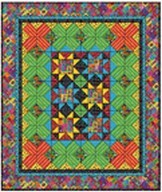 This 62" x 70" quilt is shown using a variety of trendy colors. 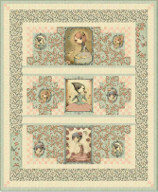 The overall scrapbook feel helps to showcase the central image of the singing birds taken from the panel design. This beautiful group, from Liz Dillon, will take holiday decor to a new level with Metallic accents. Great fun for Halloween! 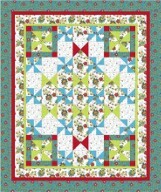 A playful patch and fun border stripe make this an easy quilt with a lot of impact! 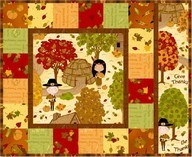 Beautiful quilt with two options. Project also includes throw pillows. Snowman bakers are busy with holiday prep but the large panel makes for quick and easy projects when combined with the yummy coordinates! Projects include a large wall hanging, apron and potholders. 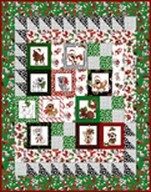 A fun holiday quilt for dog lovers! Project includes a paw-shaped Christmas stocking and dress-up bowtie or hair bow for your favorite pup! An adorable wall hanging featuring a happy snow family. Revised to correct yardage May 30. 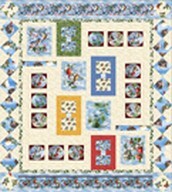 Beautiful holiday quilt will warm your home for the season! 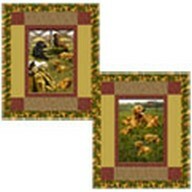 Golden lovers will want to make both of these wall hangings perfect for decorating a den or home office! Fun wall hanging perfect for the kitchen or as a gift for that tea loving friend! Vintage fans and movie buffs alike will love these fabrics featuring movie posters, memorabilia and scenes from Gone With The Wind(TM)! Beautiful in black and cream! 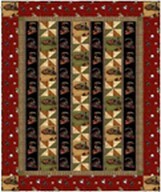 Make time to treat yourself to this quilt! 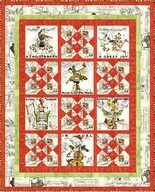 Beautiful quilt features the angels made famous by Jim Shore! 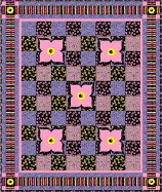 shown in our ad in the Summer 2009 ad in Easy Quilts! 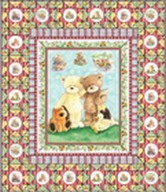 Children will spend hours poring over the incredibly detailed panel that is the centerpiece of this delightful quilt featuring Animal Alphabet Games! 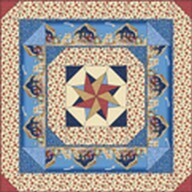 Combine brilliant colors of Prism II with Artifacts to create this beautiful quilt! This eye catching embellished wall hanging is sure to become a conversation piece! 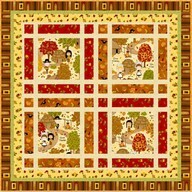 From the design team at Possibilities, a magnificent quilt in beautiful fall colors! 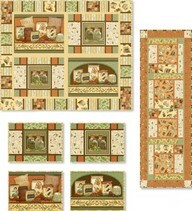 The on trend earthy teals and brown in this classic quilting group will update any decor. 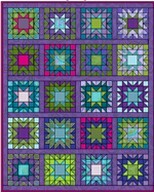 This lovely quilt is actually just one block! Warren Kimble's Birdhouses is the perfect complement to the traditional Carpenter's Wheel block. 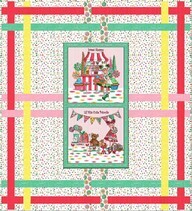 Kari Pearson's Celebrations captures the fun and energy of a childhood party!! 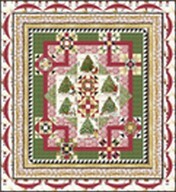 This beautiful quilt will become as much a part of your holiday decor as the tree itself! Easy project to enhance your holiday decor! Use the smaller motifs from the panel for stuffable tree ornaments! 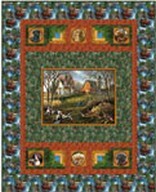 "Country Canines" depicts man's best friend doing what he does best - playing, fetching and romping in beautiful outdoor settings. 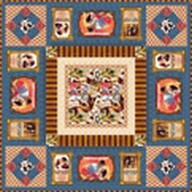 This quilt is perfect for warming up a den on crisp Fall days or as a gift for any dog-lover! Fun on the farm! Kari Pearson's joyful depiction of farm life will delight children of any age! 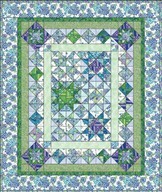 Advanced level quilt design by Diane Nagle employs foundation paper piecing for most blocks. Susan Branch reminds us - you've got to have Friends! 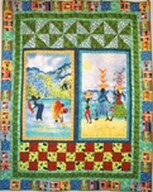 Beautiful quilt design by Vicki Niro combines applique and traditional piecing. Beautiful quilt in shades as soft as a Gypsy Breeze! Embellish with hot-fix crystals for hint of sparkle! 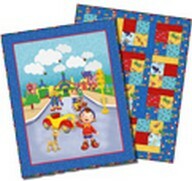 Happy quilt features Noddy in his signature primary colors! 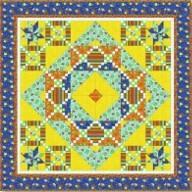 Quilt design by Aileen Sansone. Majestic deer in their natural habitat are the subject of this masculine collection from James Meger. 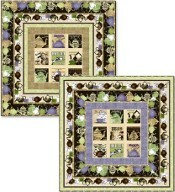 This collection is perfect for a quilt for the nature lover! 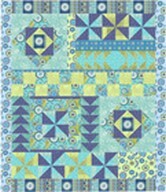 Island motifs and sun-drenched colors of Kari Pearson's Island Friends makes this a fun quilt! Easy to make and perfect for a beginner, this quilt can be made in a weekend just in time for vacation! 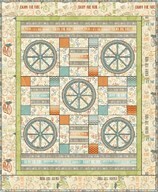 Julia Cairns' beautiful watercolor art is showcased in this quilt using her new Joyful Days collection. 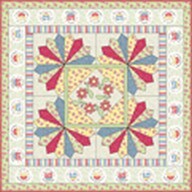 A timely message and bright energetic prints will make this quilt a favorite for any child. Be sure to make the accompanying tote bag! 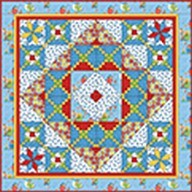 This challenging strip quilt is a Labor of Love featuring the beautiful, clear colors and joyful imagery of Julia Cairns' paintings. Kari Pearson's whimsical artwork encompasses the wonder, joy and adventure of roughing it! 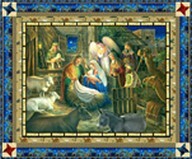 A beautiful Christmas group from artist Jim Shore depicts the nativity. 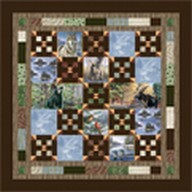 Nature enthusiasts will love the untamed images of a variety of fauna - bears, deer, moose in this majestic quilt. Julia Cairn's once again brings the beauty of Africa to us on fabric. 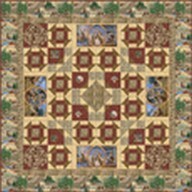 This time it is the wide open savanna and the quiet, contemplative feel of this line is captured perfectly in this quilt. Paddington proves he is an all season athlete in this fun collection! 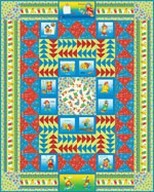 Adorable quilt in the happy primaries of Paddington's ABC's will brighten any child's day! Make this quilt to celebrate Paddington Bear's 50th Anniversary! 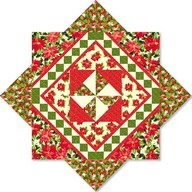 The design team at Possiblities brings you this beautiful modified log cabin quilt using Petals & Paisley! James Meger's latest focuses on these wonderful birds as they take flight into the morning sky. 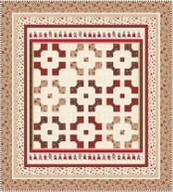 The fine detail and rich colors are sure to brighten any room that this quilt happens to be in. 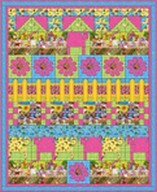 Happy, smiling gardeners populate this challenging quilt! 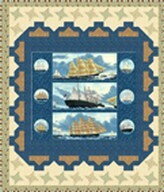 The perfect quilt for a sailing enthusiast or to decorate a vacation home or gentleman's den! 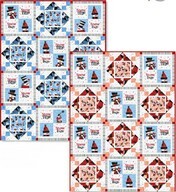 A delightful quilt perfect for holiday decor, featuring Jim Shore's Santas! 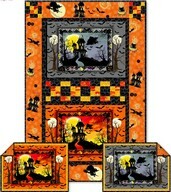 Loralie Designs - Sew Fabulous! Each one of the sewing divas in Loralie's fabrics is indeed, Sew Fabulous! 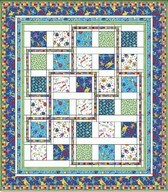 Fun and fanciful, this is one quilt no stitcher wants to be without! 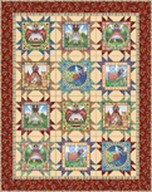 The perfect quilt for bird lovers! James Meger's art features North American songbirds. 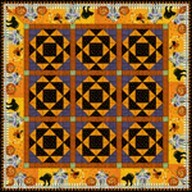 Quilt designed by Lisa Giesbrecht. 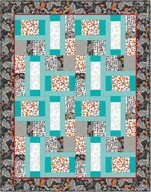 This easy to make row quilt features the "Iron Horses" of yesteryear! Just the thing for any rail enthusiast or history buff in your life! Still laughing, still loving, still stopping to smell the roses! Still celebrates the little things in life. A portion of all proceeds is donated to breast cancer research. Handy drawstring tote has roomy pockets inside and out to carry all your Summer essentials! 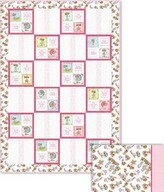 Make an adorable quilt quickly using the panel from this whimsical group! Loralie's Fairies are decking the halls! 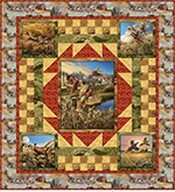 This quilt by Pat Harrison is sure to become a family favorite. 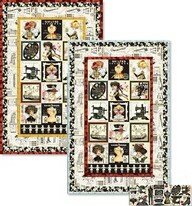 Loralie Designs cooks up some great fabrics featuring chefs in this collection! 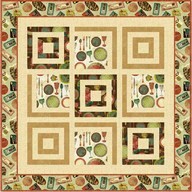 What's Cookin' quilt designed by Vicki Niro. Enjoy the nip of a frosty winter's sleigh ride...in the comfort of your home! 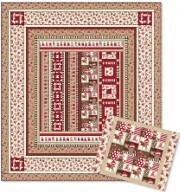 This lovely wall hanging will enhance any decor! Adorable crib panel makes an easy and quick quilt - backed with coordinating flannel, it will be super cozy for that special little person! You can almost smell the rich aroma of great coffee with this group! 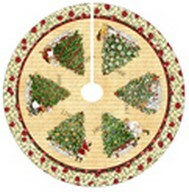 Large wall hanging or tabletopper is perfect for that coffee lover's kitchen. Projects include a unique apron, potholders and napkins! 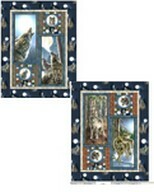 Feel the wonder of the wilderness in this stunning set of wall hangings featuring the wildlife genius of James Meger. 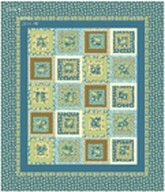 Large scale motifs in teal, aqua and chocolate make this quilt a fashion statement! 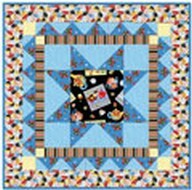 Fun and happy quilt features kids happily stitchin' away! 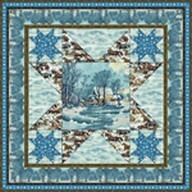 Design by Pine Tree Country Quilts. 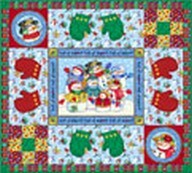 Reversible quilt features Noddy and friends on one side and a simple pieced motif on the other! 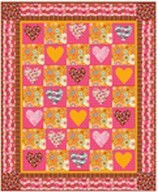 Penny Lane is a bright and happy, easy to make quilt! 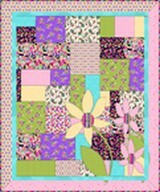 Pop Floral is a happy, fun quilt and best of all it is easy to make! 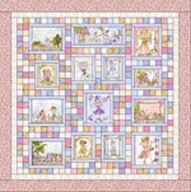 Loralie's ladies relax and unwind in this quilt full of classic resort themes! 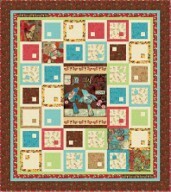 Those adorable House Mice are sewing up a storm in this cute quilt by Diane Nagle! Classic floral patterns in rich, saturated colors are the hallmark of this collection from Possibilities. The allover floral and floral stripe are the stars of the collection, attended by the beautiful coordinates.